In case of emergency (blankets) | Got arrows? I camp a lot and have a cabin in Maine that is off grid. I try to be prepared in case I am caught without heat and have to spend some time waiting for heat (or rescue). 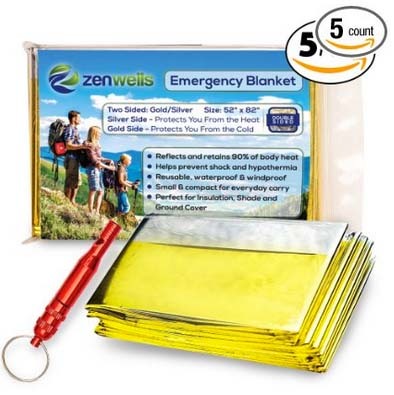 This 5-pack of mylar heat blankets and survival whistle are small and easy to store in the car, cabin or even a handbag. One could also use them as a reflective signal for locating help. This entry was posted in product_review and tagged product_review by Pola. Bookmark the permalink.